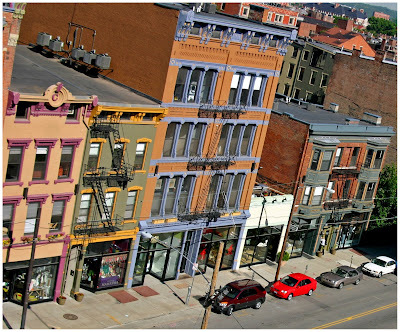 One of Cincinnati's trendiest shopping districts is celebrating this Friday with "Vine-L Friday" in the Gateway Quarter located in the heart of historic Over-the-Rhine. The Vine-L event is a mid-summer clearance where store owners are offering discounts and discussing what's to come with their new fall merchandise. City Roots, Iris Book Cafe, Joseph Williams Home, The Little Mahatma, A Lucky Step, Metronation, Mica 12/v, Outside, Park+Vine and Urban Eden will all be participating. Stores in the Gateway Quarter are open from 11am to 8pm. To view the participating store's websites visit the Gateway Merchants Group website. 3CDC (check out their new website) is also recommending that you make a night of it in Cincinnati's center city by hitting up Vine-L Friday in the Gateway Quarter with some dinner at Lavomatic and live music from Bad Veins on Fountain Square that starts at 7pm. It would be nice if the Gateway Quarter would be able to show off some of the apartments and condo's that are available. The last time I visited there was a street fair of sorts and the news reported that condo's would be open to explore and the event went on from noon to 5. I had to work till 3 and headed down to see some living alternatives only to fid out hat ended at 3. I was very dissapointed. Contact Holly Redmond if you would like to check out some of the units available there. She is one of the Gateway Quarter sales agents and schedules showings quite often. I would imagine that if her schedule permits that she would be more than happy to show you around. I've included her contact information below.